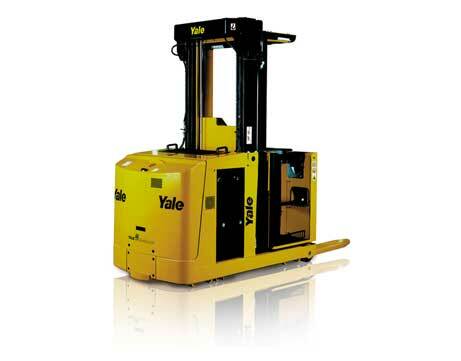 Yale Order Pickers can assist with both vertical and horizontal order picking needs. These order pickers provide advanced solutions for high density storage and are designed for high-level picking heights with proportional lift and controls. Designed to provide customers with low-effort-fly-by-wire electric steering for fast manoeuvrability, these order pickers facilitate first and second level of picking. Equipped with performance matched traction and pump motors for maximum productivity, the spacious panorama masts provide excellent visibility. Each order picker provides excellent performance with its powerful AC drive motor which gives fast travel speeds for long runs and load shuttling of up to 13 km/h (in some models). 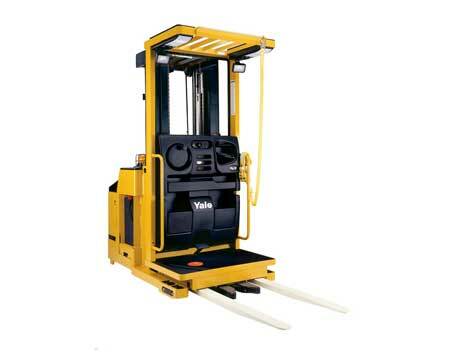 It has enhanced operator controls and has the provision of speed reduction for corners. Another specific feature is of regenerative braking. The regenerative braking is the electric motor braking when the operator changes direction. This feature dissipates heat in the traction motor and reduces the use of service brake. Regenerative braking, while enhancing productivity, also protects motor components. 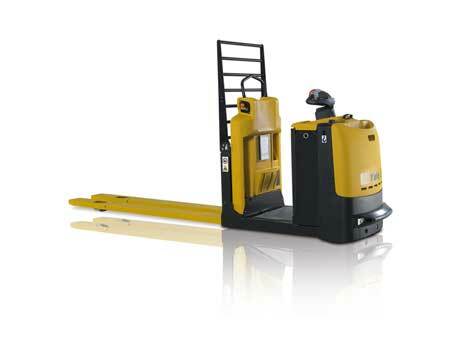 The gear on gear steering gives the operator a better feel for the ground and makes the order picker more dependable. Some models come with scooter controls which give an effortless electronic steering of 65o which results in drive wheel steering of 90o. The optimised controls on the order pickers maximise controllability. The advanced tiller arms have comfortable angled grips with large butterfly buttons for increasing speed and braking. The electric steering helps in effortless manoeuvres, while the full sensitive floors detect operator presence and provide floor controlled rising platform. The easy on and easy off platform height prevent driver fatigue. This, combined with the scooter controls increases ergonomics and increases accuracy. Impact resistant body with full metal cover and bumper protects against collisions and ensures productivity, with minimal down time. The reinforced load wheels are arranged in tandem to share the weight. The improved wheel design prevents accumulation of wrapping material on the wheels. These wheels provide a smooth ride and lower floor loading which in turn increases long term dependability. These order pickers come with a durable pull-rod design, which provides smooth lifting and lowering. This is more resistant to bowing and bending and prevents the ovalizing of the axle support. The raised pivot for load wheel axle prevents grounding of the forks. Like all Yale products, the order pickers have a low cost of ownership with integrated systems controls. The dual technology MOSFET Combi Controllers have AC for traction motor and Direct Current for the pump motors. This enhances energy efficiency and enables advance control features. The cost of ownership is further reduced with the lower maintenance costs due to low maintenance AC Motor. The electronics on these trucks are sealed against dust and debris and have an absence of brushes and forward and reverse contactors. This combined with durability lowers the cost of ownership. The order pickers have very easy service and repair requirements. These trucks have a single plug in for diagnostics and have one-piece hood access to all key parts. This helps identify faulty areas. The low maintenance AC traction motors also is fully enclosed to be protected against dust and debris. The gear-on-gear steering reduces the constant repair and maintenance needed for chains. These order pickers are known for minimising down time reducing repair costs and ensuring maximum uptime.